Tupperware Jug With Push Down Sealed Lid. Condition is Used. Dispatched with Royal Mail 2nd Class. Cream coloured jug with yellow lid. Very good used condition. In very good condition throughout as seen in photos. Has push button vacuum sealed lid which works fine. Great for storing and pouring liquids and maybe for Ice Cubes too. Made in Great Britain on base. Lovely pair of salad dressing/oil jugs in good unused condition as shown in pics. Each one stands 7" tall and together weigh 208gr. The seals are good and tight. 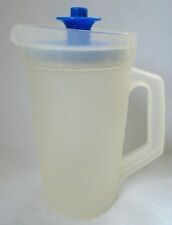 Tupperware Tall Water Juice Jug With Lid & Spout Lid. VGC. 9 1/4” Height. Condition is Used. Dispatched with Royal Mail 2nd Class. The yellow lid is in lovely condition. The base has a few used scratches. Lid With Sealable Lid. Height 20cms (8’) Approx.